For me watching El Cazador de le Bruja was love at first sight. The thing about falling in love at first sight is that it's a wildly irrational and unwavering kind of love; despite what your better judgment and your friends say, you just can't help the way you feel. Nadie is a bounty hunter; she's quick with her gun and even quicker with her tongue. Ellis is a witch with a huge bounty on her head. They partner up to head south in search of the answers to Ellis' past. Throughout the course of their adventure, the pair find themselves eating super tasty tacos, serving super tasty tacos, and even singing about super tasty tacos. Unfortunately it's not always a fun taco fiesta for the girls; the road they're on is not easily travelled when being chase by bounty hunters, a love-crazed stalker, and various other types of ne'er-do-wells. The story is flimsy at best, but there are times when not much more than basic motivation is needed to get the job done. The relationship between Nadie and Ellis is the crux of the series. Where the duo is going doesn't really matter, since they have such life and personality that you enjoy just spending time with them. And spending time with them is basically all that you do. For all its guns, bounty hunters, and witches, action does not play a big role in Bruja. Nadie does fire her pistol quite often, but only to nudge things along, not to dazzle the audience with shootouts. The series comes off as a true western, albeit one of the carefree, low intensity, good natured variety. Of course being that it involves witches, it does delve into the supernatural but somehow always manages to remain at ground level. Magic never once overwhelms the modern day setting and realistic atmosphere, nor does it ever feel haphazardly forced in to spice things up. For as much as I do adore this series I fully realize it's not for everyone. At times Bruja doesn't seem to be going anywhere. Though maybe it doesn't need to; maybe you don't want it to. However, for some - probably most - this pace could be frustrating. If Nadie and Ellis fail to strike a chord with you, it's very likely you'll find yourself deathly bored. Even if they do strike a chord with you don't be too surprised if you catch yourself yawning or eyes adrift. Like I said, it's a western: That's just the nature of the beast. The ending leaves something to be desired. I won't say it ends poorly, but possibly too lightheartedly. When focus is put almost entirely on characters it presents the opportunity for an incredibly impactful, if not devastating, end. El Cazador de le Bruja does not take advantage of this. The ending simply doesn't do much for the viewer or the series; in a way it could be exactly what the audience most wanted, but not what was needed. The animation is pretty average, though a fair upgrade from Bee Train's previous effort Madlax. 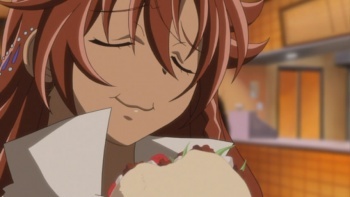 The series does work incredibly well within its limitations, never does it attempt anything too ambitious which could wind up looking silly or off-putting (refer to: Madlax). The background art on the other hand is first-rate. All too easily overlooked are the character designs. The main characters have a simple appearance yet remain incredibly stylish. In lieu of the spiky hair and belt buckles found in so many shows, physical gestures and facial expressions are used heavily to convey personality. One of the stand-out points in the character design is that not everyone is attractive; they look like real people, which is, quite frankly, odd for an anime. This puts emphasis on beautiful young Ellis, making her seem out of place in the hot desert towns. Funimation managed to assemble what is the perfect cast for Bruja's dubs, providing for one of the incredibly few examples where the English audio by all means surpasses the original Japanese (I think I can hear my credibility plummet). Each voice has so much personality that it alone is enough to bring the character to life. Nadie is full of emotion and sass. Ellis is sweet and awkward. Unlike most dubs, the voices of minor characters don't fail miserably. Also, you can rest comfortably in knowing there are no grossly exaggerated accents. It's odd to say, but if not for the voice acting I'm not positive I would have enjoyed the series very much. Bottom-line: El Cazador de le Bruja will hit home with a very select group of people, the rest it's likely to leave out in the cold. It can best be described a western buddy adventure, though I wouldn't stress the word 'adventure'. The key focus is the relationship between bounty hunter, Nadie, and her bounty, Ellis. In the end the series feels like you're kind of just hanging out with the two of them. The drama is lighthearted, but works for what it is. Superb voice acting gives the series life. Recommendation: As much as I personally enjoyed El Cazador de le Bruja I can't in good faith recommend it to others. If you're a fan of westerns and don't expect anything too action packed or dramatic, you might want to give this a try. Also, fans of the other two "girls with guns" series by Bee Train may like this, but I make no guarantees. However, if you are interested in seeing dubs done right there's no better place to look. Salvan Bonaminio is curious if this is how the Japanese always feel about their voice acting... it's kinda nice.